Of all the weight-loss products out there, the most powerful tool you can use for weight loss is as simple as pen and paper! 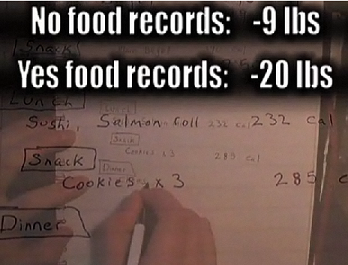 Keeping a food diary has proven to be a successful tool in the quest to lose weight. Recent studies by the American Journal of Preventative Medicine have shown that keeping a food diary led to nearly double the weight loss over dieters that did not keep a food journal. Nearly 1700 overweight or obese Americans with high blood pressure or bad cholesterol participated in a 6-month weight loss study. The people in the weight-loss study exercised 6 days per week and followed a heart-healthy, low-sodium diet rich in fruits, veggies and lowfat dairy. The program was success with each person losing an average of 13 pounds. People who did not keep a food diary lost only 9 pounds while those who kept a daily record of what they ate each day lost 20 pounds! 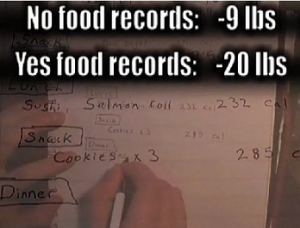 Nearly double the amount of weight of the people who did not keep a food journal. But why does this method work? Experts agree that personal accountability is a huge part of it. Accountability is the most important thing behind any successful change, including weight loss. It also provides a way for people to be more aware of the pitfalls they fall into on a daily basis. How do you keep a food diary? Write down everything you eat each day and the number of calories. Stay on track. If you are unsure of the calorie content, you can visit http://teambeachbody.com and visit the Meal Planner where you can get nutritional information on most foods! Get that food diary started today and get healthy! Don’t forget to exercise. We have many programs suited for all levels of fitness! Visit the Team Beachbody store and find a fitness program that’s right for you!